The patient stands perpendicular to and 2–3 feet from a door or wall with the right hand on the wall for support and the right leg behind the left leg. As the provider pushes down on the left hip, a stretch is felt in the lateral right thigh as the patient pushes the right hip toward the junction of the wall and the floor. The patient lies on floor with the affected side touching ground. A 6 inch firm foam cylinder is placed underneath the affected side hip. Arms and top leg is used to support weight. Now the patient rolls from hip to just above knee over roller stretching iliotibial band. Patient is seated, with the back upright and then brings his right ankle over the left knee. With the back straight, he gently flexes the lower spine, bringing the belly button towards the opening made by the legs. This will produce the stretch. Holding that comfortably, he then releases the leg, bringing both hips into medial rotation. Then brings the opposite leg over the opposite knee and gently stretch by flexing the lower spine, bringing the belly button towards to opening made by his legs. And then after each leg go into medial rotation and then repeat the movements. This should produce a nice warming and lengthening effect of the hips and illotibial bands. Patient Bends and crosses injured leg over other leg. Holding the injured knee with opposite elbow twists upper body towards injured side. 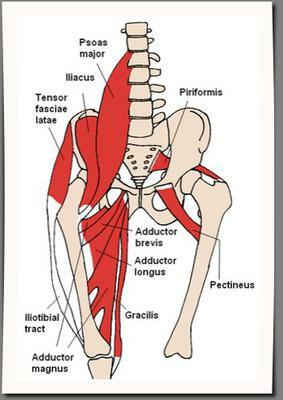 This stretch targets the hip flexors (psoas) and quadriceps, while concurrently placing tension on the iliotibial band. This stretch also targets the hard to reach fibers of the IT Band on the outside of the knee (lateral retinaculum). Great stretch for runners, walkers, and cyclists. The Patient is in side lying position with the affected side up. Patient bends the affected legs knee and then holding on to the foot tries to touch the foot to buttock. After this the patient abducts and then extends the affected leg. Now holding the extended position adduct the leg and apply overpressure with the other leg.